Red safety filter assembly for LPL 7700 (670XL) and 4x5 enlargers. 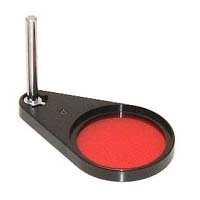 The assembly includes the mounting post, filter holder, and red filter. Please note that it does not include the lock screw that secures the post in the lens stage. For 7700 enlargers the lock screw is item #LPL3231-186, and for 4x5 enlargers the lock screw is item #LPL3231-185.